Digitial Geishas starts off slow. Pico Iyer’s introduction to the collection is breezy (“When guidance comes in this anthology, it comes only from a six-foot tall frog; many characters in these tales are weirdly passive, just killing time until a tsunami, a pregnancy or two dangerously seductive girls appear on the horizon to shake them out of their stupor”) and even more disconnected and fragmented than the travel writer’s usual style. The opening piece, “The Floating Forest,” is boring, even though it’s written by Kirino Natsuo, a writer of psychological thrillers whose work is usually anything but boring. I suppose Kirino’s story about a daughter of a famous writer is meant to establish a theme of breaking away from the past and emerging into a new century, but it’s still rambling and tedious. The next story, Toshiyuki Horie’s “The Bonfire,” is like one last look back over our shoulders at “old Japan” and the remnants of its traditions of “pure” literature. “Ikebukuro West Gate Park” is a selection from Ishida Ira’s series of novels by the same name (which have been translated into French), and it’s awesome. The story is reminiscent of the anime series Durarara!! in its colorful urban setting, its cast of interesting and multifaceted characters, and its use of social networking and bizarre crime as plot devices. This story has everything – youth culture, counter-culture, underground culture, and literary culture – and its English translation is worth the price of the entire book just by itself. The stories that follow it are equally fascinating. Murakami Haruki’s “Super-Frog Saves Tokyo” is a perfect example of the author’s trademark magical realism, Shimada Masahiko’s “The Diary of a Mummy” chronicles suicide through starvation from a first-person perspective, Ogawa Yōko’s “The Sea” is all sorts of strange and creepy and touching and brilliant, and Tsujihara Noboru’s “My Slightly Crooked Brooch,” in which a woman consents to her husband’s affair, is a lovely tale of obsession with the perfect twist ending. Overall, I really enjoyed reading the stories in Digital Geishas, which showcases a fairly wide range of authors, who are all (with the possible exception of Kirino) flattered by the editor’s choice of their work. Although the subject matter of the stories contained within this volume is broad, the general tone of the anthology is far more literary than its title suggests. Finally, Helen Mitsios has done an excellent job not only with the selection of stories but also with the way they flow from one to another, and the individual translations have been edited to maintain a cohesive yet unobtrusive “house style” that still manages to show off the individual writing style of each author. 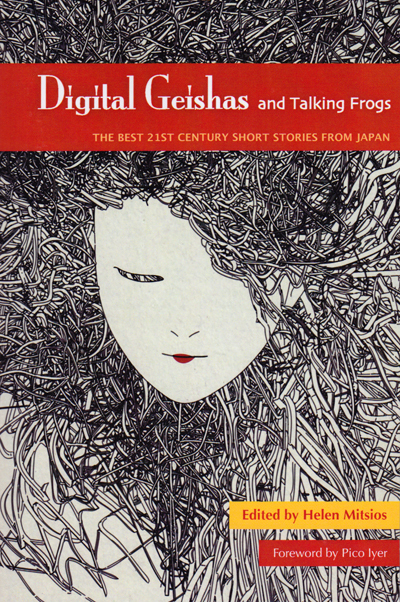 In short, Digital Geishas contains a good batch of stories that have benefited from solid editing. This book is a wonderful follow-up to Mitsio’s earlier compilation, New Japanese Voices. Review copy provided by Cheng & Tsui. This looks really interesting, think I’ll track out a copy! I’m usually not a huge fan of multi-author anthologies, but this one actually is interesting. It’s obvious that a lot of thought and care was put into the editing, at least. I wasn’t a huge fan of New Japanese Voices (or its companion anthology, Monkey Brain Sushi), so I’m happy I had a chance to read Digitial Geishas. By the way, I just found your list of anthologies of Japanese literature. It’s wonderful! I want to put together a compilation of such lists, but there aren’t that many good ones out there that I know of. Do you have any suggestions? I’m not too sure, I saw a good list recently but can’t remember where I read it, (! ), if I see it again I’ll try to remember to put up a link. I recently read and enjoyed Speculative Japan 2, on the whole I like reading anthologies although I rarely seem to read them cover to cover, but read random stories as and when. As you’ve said Digital Geishas looks like it has a great selection of authors that I want to read more of.